Focusing on energy efficiency, did you know that with the right glass in your windows you could reduce the amount of heat that escapes from your home by as much as 82%? Pilkington energiKare™, incorporating Pilkington Optitherm™ S1 Plus, has the ability to make your home warmer and cosier. Unlike ordinary double glazing, a replacement IGU that incorporates Pilkington energiKare™ can reduce heat loss and allow more of the sun’s heat energy in. This process, known as ‘solar gain’, achieves the highest window efficiency rating (WER) as well as a low u-value, helping you make a noticable saving on your energy bills. By reducing the amount of heat that escapes through your windows, you are also reducing the amount of energy needed to keep your home warm. So, by choosing an insulating glass unit (IGU) from the Pilkington energiKare™ range not only will you save money, but your reduced CO2 emissions will help to protect the environment and conserve precious resources for future generations. 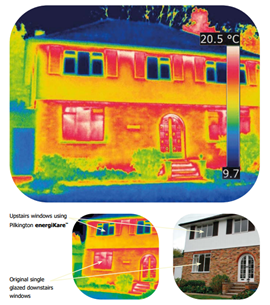 Pilkington energiKare™ incorporating Pilkington Optitherm™ S1 Plus - the benefits at a glance.